Frogs are found living in fresh water and on land as we all know but there are also a few who live underground or in trees. Such as the tree frog! I had a quick look on google but I couldn’t decide what frog this is (again, vertigo is a hinderance… it might be a pacific tree frog), please shout up if you know. Frogs have stout bodies, protruding eyes, a cleft tongue and no tail. They fold their limbs under their body, hiding their powerful legs. Frogs are fantastic jumpers, according to wikipedia the striped rocket frog, a mere 5.5cm can leap over 2 metres. Whilst frogs are well known for the jumping ability, it’s their skin which amazes me. They shed their skin every few weeks, who knew?! The skin, once shed, is then eaten by the frog which seems pretty resourceful. If you’ve put a lot of nutrients and energy into making your skin, why not reuse them? And actually, frogs are apparently really good at turning food in general into body mass. Anyone who knows me, knows I love efficiency so I find this fantastic! Bring more efficiency into life folks! Their skin is awesome in more ways; it secretes chemicals, some of which are toxic. They are sometimes talked about as having a pharmacy on their back and indeed the chemicals on some frogs’ skin have important, or potentially important, medical uses. One frog secretes a potent painkiller which is stronger than morphine and another type secretes poison which is used to make poison darts. Research is also being carried out to see if the chemicals secreted by a particular frog may be helpful in treating HIV. They use their skin to absorb water which makes them very sensitive to their environment and changes within it. There can be so many toxins in the water which can affect their health and they have no way of avoiding it really. One example I came across was the hormones in birth control pills. Some of these pass into the water system through urine and they can cause birth defects to frogs. Please don’t read this as you need to get rid of all the chemicals in your life – chemicals are our life. Water is a chemical. Salt is a chemical. Everything made of matter is a chemical. But you can be more mindful about which chemicals you interact with. Think back hundreds of years – women wore lead on their skin for beauty and it killed them. If you have a cold, don’t reach automatically for the antibiotics. Note, I am on a million meds so I’m not at all anti medication, but again I think a conscious awareness of using them rather than habitual unthinking is best. I feel that the frog card is just asking for us to pay attention to our environment and our bodies and what we put into both of them. Frogs can pass oxygen through their skin which means they can respire in environments where they cannot breath conventionally. However, this is only possible if their skin is moist and it is this which ties the frog to water. So the frog in the picture, which is being rained on, is probably loving the rain! How you feel about the rain, and many other things in life, depends so much on perspective… Wherever you find a frog, there will be water nearby. Whether that’s a pond or a stream or a puddle in a leaf in a tree in the rainforest. These land dwelling animals cannot forget about their watery needs and nor should we. If you’re eating or a bit squeamish, pass over this paragraph. I think it’s fascinating but that doesn’t mean you will… Frogs have long tongues (well, a few frogs don’t have any tongue but in general…) which are coiled in the mouth. When food comes along, it shoots out and springs back really fast. So far, so what? The next bit is the kicker. They then push the food, which they eat whole, down their throat using their eyes. They literally use their eyes to eat. How interesting is that?! Talking of eyes, they tend to have bulging eyes which see distance better than close up. Beware of immediate dangers which can be overlooked whilst you’re scanning the horizon. The mosquito which sneaks up behind you is probably more deadly than the lion which you can barely make out. The way eyes are positioned means a frog can hide under water with just their eyes above the surface which is great for hunting food. They also have a membrane which protects them when they’re under water. We associated frogs with ribbiting but they make other noises as well and their croak is unique to their species. To make their call, most puff up their vocal sacks. This self inflation can mean the frog is seen as prideful. If this is the pacific tree frog then they do make a stereotypical frog ribbit. This sound, to me at least, has echoes of the ba-bum of a heartbeat and perhaps chanting or using this sound as a mantra could help when meditating on what the frog card has to say. Frogs lay eggs in water (frogspawn). Frogspawn hatches into tadpoles (sometimes called polliwogs which I love!) which have tails and internal gills. It grows a bit and develops limbs and lungs. Then, through metamorphosis over about 24 hours, it then becomes an miniature adult frog and can venture onto land. This progress from water to land has been paralleled with our own evolutionary development, both as a species and personal evolution and growth. Has the frog come to you now because you are venturing into a time of change, because you need to step into necessary growth? Perhaps it is time to get out of the water and onto land. Whilst emotions are great and most of us don’t spend enough time with them, they can become all consuming and there is a wider world out there for us too. Note too that frogs tend to lay their eggs in ponds or areas where the water is calm and sheltered. Perhaps it’s time to leave the relative safety of the pond? Yes, it’s scary as hell to head out onto land where herons can see you and dive after you but it will be rewarding as well. Frogs and beliefs and stories and mythology is an abundant field. If you find the frog chimes with you or seems to have something to say to you, do your own research, there is so much out there. I’ll skim over a few of the ideas here but I won’t go into much detail or this would be very very very long! Frogs are associated with fertility and new life. In the past they were used as a pregnancy test. Because of their life cycle, they are used as a Christian symbol of the holy trinity and resurrection. Ancient egyptians believed frogs were divine and also linked them with regeneration. The hieroglyph of a tadpole stood for the number 100,000. We have to remember how important the river Nile would have been to ancient Egyptians and frogs were probably associated with that. As such, it is not so suprising that they held the frog as a symbol of life and fertility. The goddess Heqet was represented as a frog and was the goddess of fertility. In terms of superstitions, we have the idea that the sighting of frogs heralds the end of the dry season, it’s lucky to meet a frog and unlucky to kill a frog because they house the spirit of dead children. Because of the association with weather, they feature in anti-drought ceremonies. There are a number of tales of a frog in a well where the frog is symbolic of someone lacking in understanding and vision. There is this idea that if you put a frog in boiling water, they jump out but if you put it in cold water and heat it, they don’t. This is disputed and please don’t try it at home. But the idea is that slow changes build up to massive changes and our reaction to them is then different. As a very trivial sort of example, it’s like the idea of someone getting taller. Mum who sees him every day doesn’t notice her boy has shot up a foot but aunty Mable who only seems him once a year does. Look back on your own progress, it’s easy to think nothing has changed as so much of our life is in baby steps. 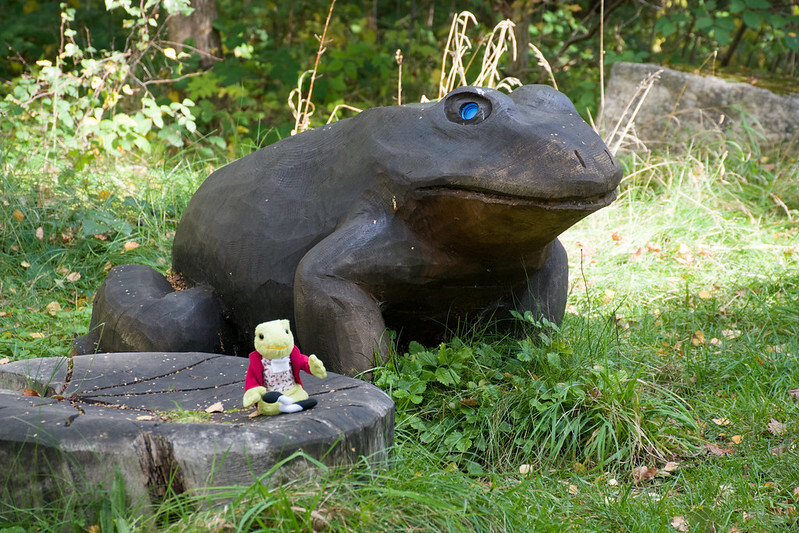 In culture, we see the story of the frog prince as well as the frog in many many tales including the lovely Jeremy Fisher pictured above! In a lot of these, the frog is portrayed as ugly, clumsy etc but with some sort of concealed beauty or skill. Like the oyster, it’s a reminder to look inside.